Despite the horrible “summer” weather in Copenhagen, the season has brought us some exciting great news – a new collaboration with norwegian brand Dandy & Son. We saw this as a great opportunity to write a small article regarding their brand and beautiful products. Dandy & Son is a family-owned menswear brand based in Oslo, Norway, with a great line of products expanding from soft linen shirts to beautiful sevenfold silk ties, suitable for any occasion, formal or casual, for the modern gentleman. Most of their shirts has an french cuff option for the gents feeling for a little extra. 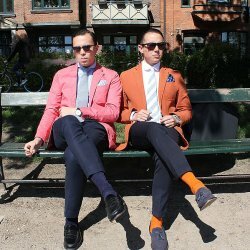 Another great feature of the shirts from Dandy & Son, is their unique DandyFit, that’s applied for all of their shirts. The DandyFit provides a great slim fit when put on, making sure the shirts fit around the waist, chest, shoulders and arms will be the least of your concerns. So If your planning on expanding your shirt or accessories collection, make sure to give Dandy & Son a look, affordable excellence, high quality and timeless design. Listed below, are our take on some great outfit combinations with the extraordinary products from our friends at Dandy & Son. As mentioned in a former article we’ve incorporated the shirts in some summer outfits we found suitable for weather the particular day. Mostly light fabrics like linen and seersucker in unconstructed jackets and suit. And we’ve let out the socks as well to let the summer air circulate around the ankles. Lastly and most important of all, go visit their website at www.dandyandson.com and get your new essentials for your gentleman wardrobe. Until next time feel free to check out the other articles and the look book.